Penguins are to make a comeback to a zoo in Lancashire for the first time in more than a decade. 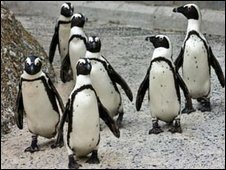 Blackpool Zoo is expecting the arrival of 20 African penguins in June. The colony of penguins, which is arriving from two Spanish conservation centres, will live between the sea lion pool and the ape house. Darren Webster, Blackpool Zoo's director, said the return of the penguins was part of the park's ongoing investment programme. He said the zoo felt the penguins would be a good investment as the birds had been one of the most requested attractions by visitors. The population of African penguins, known as the black-footed or Jackass, has shrunk by almost 90% since the early 20th Century when there were around 1.5m. Blackpool Zoo said the shrinking population of penguins had led to worldwide breeding programmes in animal parks.